"This is my grandmother's famous pie recipe. I have many memories of making this pie with her as a child, and tasting the sweet and gooey satisfaction of biting into that first warm bite of utter deliciousness. My opinion: it is impossible to beat this one-of-a-kind pie." Stir white sugar, brown sugar, tapioca, and salt together in a large bowl. Add rhubarb and blueberries; toss to coat. Divide the pie dough in half and roll each half out into a 9-inch round. Place 1 round of dough in the bottom of a pie plate. Pile rhubarb-blueberry mixture on top of the dough and top with the remaining dough round. Trim excess dough from the top crust to leave a 1/2-inch border below the top rim of the pie plate. Tuck the top edges of the crust under the bottom crust and crimp border together. Place pie plate on a rimmed baking sheet. Bake in the preheated oven for 20 minutes. Reduce oven temperature to 350 degrees F (175 degrees C) and continue baking until the crust is golden brown and the filling is bubbling, 25 to 30 minutes more. Cool for 2 hours. I followed the recipe as is. It was easy to put together and turned light and flaky with a good flavor. 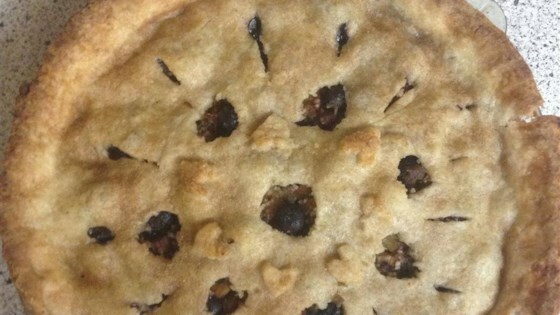 I have made five pies using this recipe and they all have turned out really great! Followed the recipe exact with fresh fillings. Big hit with us! Definitely in my recipe box! Used 3 Tablespoons of cornstarch instead of tapioca. Used Pillsbury refrigerated pie crust instead of homemade due to time constraints. This pie was so good.